Base stations are at the heart of mobile networks. Deployed throughout a territory, they maintain the invisible link that connects mobile users to those they are talking to. The web of base stations allow them to move without losing the thread of the conversation and to be reachable anywhere. In mobile networks, the base stations (or base stations) transmit/receive radio waves that carry traffic in a given territory. Just as television and radio transmitting antennas work thanks to their own transmitting systems so, mobile phones could not function without them. Their deployment has a twofold objective: to ensure the widest possible geographical coverage, and to maintain a sufficient density of transmitting and receiving antennas to handle all the traffic at a given point. Given how radio waves spread, antennas are usually installed high up, for example on the roof of the building or at the top of pylons. Their beam spreads nearly horizontally like a lighthouse on the coast, only reaching the ground at a distance of between 50 and 200 metres from the antenna, depending on its height. The further away from the its source, the more the beam’s intensity weakens. Across their territories, operators install different types of base stations, with a transmitting power ranging from a few milliwatts to tens of watts. are generally used in large cells. They can convey a large number of simultaneous communications, but emit only in a 120° horizontal sector. This is why the same mast or roof terrace of a building has typically three antennas in order to relay communications at 360°. Omnidirectional antennas are geared towards the small cell and installed on building facades or street furniture in dense areas with significant mobile traffic (stations, airports, shopping centres etc. ).As their name suggests, they emit in all directions. Finally, small indoor antennas with a few milliwatts of transmitter power and a range of a few metres can be installed on walls and ceilings, to serve as a mobile relay or Wi-fi access point inside or around public buildings (hotels, offices, train stations, etc.). To find out where antennas are located, the easiest way is to contact the operators who deploy them. 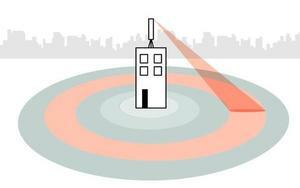 But in some countries, the authorities keep an updated map of base stations directly accessible to the public.